HomeDo We Need the National Weather Service When There is a Weather Channel? Do We Need the National Weather Service When There is a Weather Channel? Several years ago during a budget hearing, a Congressman supposedly asked why we needed the National Weather Service when lots of forecasts are available on the Weather Channel. This guy was serious, but misinformed, since much of the material on the Weather Channel--the observations, the model output, the warnings---all came from the National Weather Service. President Obama knows--it seems that in nearly every speech when he talks about agencies we dare not cut the National Weather Service is mentioned. What do you have to do to become a NWS meteorologist? You need a real degree in meteorology (at least a B.S.) --which means you had a lot of math, physics, and atmospheric sciences. Getting into the NWS is quite difficult and they only have a few positions a year open--so those that get in are strong candidates. The NWS then has an extended and comprehensive training program and intern forecasters have to spend several years working their way up until they become journeyman staff. Here in Seattle the local office is at the NOAA Sand Point facility, and they have a nice office with a wonderful view of Lake Washington. The "Meteorologist in Charge"--the head weather honcho-- is Brad Colman, who has exceptional academic credentials (Ph.D. from one of the top programs, MIT), and deep operational experience. 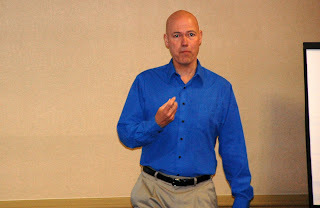 Brad Colman, Seattle NWS Head Guy. He likes blue shirts. Officer (Kirby Cook), who works on software development and training. Under them there are roughly 15 forecasters and interns. And there is more--there is a Service Hydrologist, working on floods and heavy precipitation, and the NW Avalanche Center, which provides mountain forecasts for the region. 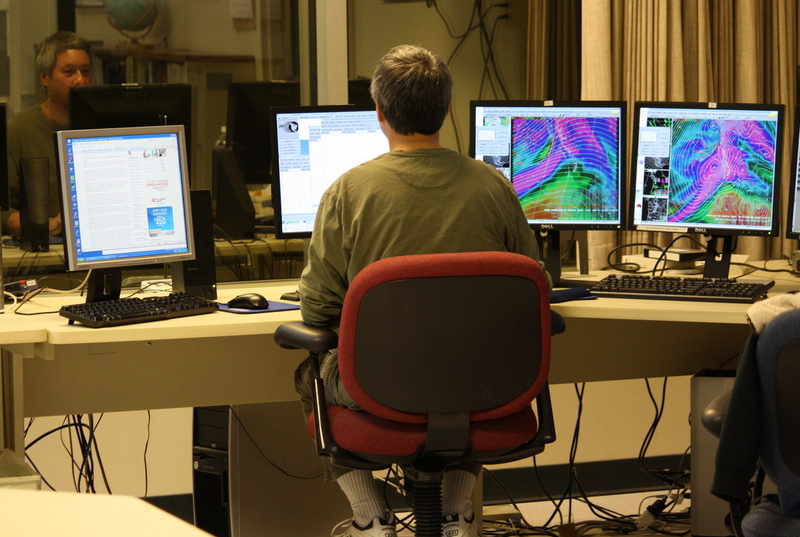 Plus meteorological technicians that keep everything working and administrative support staff. NWS Forecaster Working. Looks like a good storm! The way they make and communicate their forecasts has changed radically during the past decade. In the old days, a forecaster would type out the forecast, after looking a a variety of computer-based weather forecasts, satellite and radar imagery, and a wide range of other observations. Not anymore. Now they play around with graphical renditions of the weather--drawing the fields on a screen and then the forecast text is created by a computer. You thought video games are fun. Making forecasts on their graphically oriented system--AWIPS--is better. This is the Graphical Forecast Editor (GFE) used by NWS forecasters to create forecasts. Not for color-blind folks. There are over a hundred similar offices around the U.S., each one associated with a Doppler radar. Our office will have more than one soon when our new radar is online. With so many offices, forecasters can become masters of their local weather--which is very important. How often do you hear the Weather Channel folks talk about the convergence zone, the Enumclaw winds, or the Sequim rainshadow? And it is well known that the Weather Channel ignores the West Coast. They will even admit it. Behind each office there is a huge and expensive infrastructure--the observation systems, the computer forecasts on large supercomputers, the satellite and radar networks, and much more. It is amazing it all works so seamlessly. And there is more. 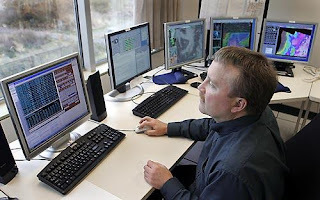 There are major NWS centers for specific forecasting issues: a Storm Prediction Center for severe convection, a Aviation Weather Center for aviation meteorology, a Marine Prediction Center for the seas, etc. 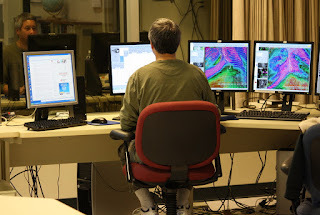 All the numerical weather forecasts are made by the Environmental Prediction Center in Maryland (I was there last week). They are located in an old and decrepit building worthy of a wrecking ball (no I wouldn't waste a good wrecking ball on it)--but next year they are moving to a state-of-the-art facility near the University of Maryland. There is a lot of carping about supporting the Federal government these days, but some agencies, like the National Weather Service, are worth every penny and provide a huge benefit to the nation.